Christmas has to be my favourite “food” time of the year. It is the only holiday that you can eat 4 helpings without being secretly judged by friends and family because they too are eating 4th helpings! Gingerbread is such a classic Christmas food and extremely moreish! 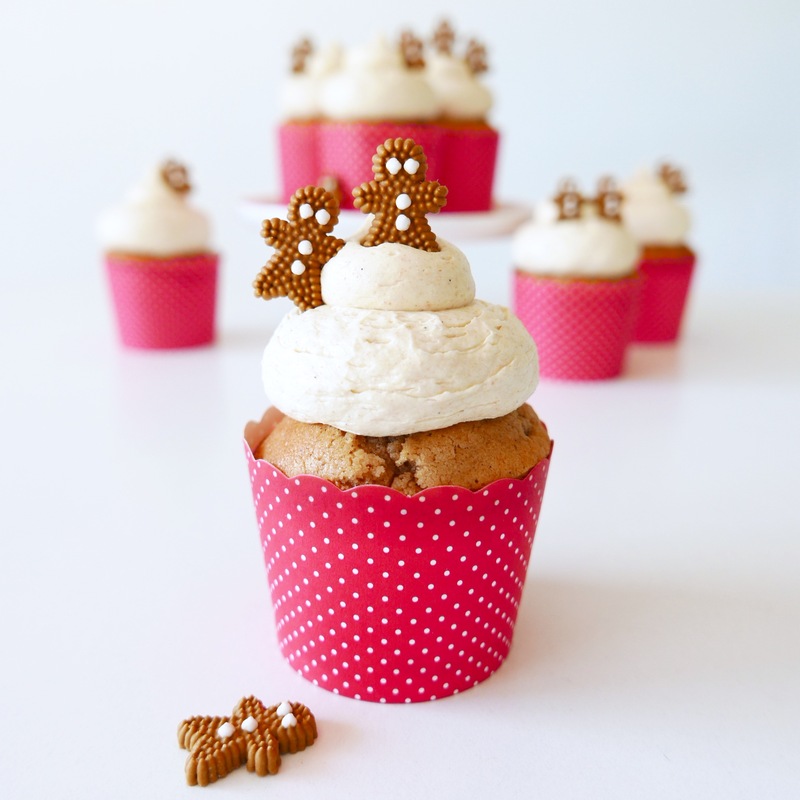 This year I thought I would make something a little different and create the ultimate gingerbread cupcake. The “Naughty but Nice Cupcake” if you will. “Naughty” because it is definitely not calorie conscious but “Nice” because it is a simple recipe that won’t have you stressing out the night before Christmas. I hope you enjoy it as much as my family and friends! Preheat oven to 180ºC and line two cupcake trays with 16-18 patty cases. In a mixer beat butter and sugar on high speed until light and fluffy. Add golden syrup and mix to combine. One at a time, add eggs to the mixture beating well after each addition. Mix the spices and vanilla bean paste in on a low speed until combined. Sift flour into mixture and mix until combined. Once combined add milk slowly. Once all the ingredients have been added, pour the boiling water slowly into the mixture beating on a low speed until combined. Fill patty cases 3/4 full and bake for 15-20 minutes or until a skewer comes out clean. I check my cupcakes at the 15 minute mark but they are usually baked at the 17 minute mark. For the icing: Melt the butter on a medium heat until it has browned in colour. The mixture may boil so be careful not to burn yourself and keep an eye on it at all times. Once the butter is melted let it cool to room temperature. It should set and act like standard room temperature butter. From here whip your butter on a high speed until light and fluffy. I normally whip mine for about 5-10 minutes. Sift in the icing sugar and add the vanilla bean paste and mix for another 1-2 minutes until combined. Pipe or use a spatula to ice your cupcakes and enjoy!